This special issue presents findings of the transnational research project “Crisis, Conflict and Critical Diplomacy: EU Perceptions in Ukraine, Israel and Palestine” (C3EU) (2015-2018) focusing on Ukraine-specific results [C3EU, online]. Supported by the Erasmus+ of European Commission, C3EU united experienced and early careers scholars into a research team of 36 who studied and facilitated best practice in EU perceptions research. The results of the project contributed to policy debates on EU global and regional governance and fostered academic-policy-makers' dialogues in Ukraine and the EU. Leading to this extensive outreach to the stakeholders, the C3EU research consortium had consolidated academic excellence by gathering linguistic and non-linguistic information, and producing comprehensive and methodologically rigorous analyses of EU perceptions and narratives in Ukraine and Israel/Palestine reflecting major societal challenges. The articles published in this special issue focused on perceptions and images exposed in narratives on the EU, Ukraine and EU—Ukraine relations are interdisciplinary. They combine methodologies of cognitive and communicative linguistics with the findings of communication and media studies, cultural studies, political science, international relations, and European integration studies. C3EU (Crisis, Conflict and Critical Diplomacy: EU Perceptions in Ukraine, Israel and Palestine), Available from: https://jeanmonnet.nz/c3eu/. Chaban, N., Magdalena, A.-M. (2014). External perceptions of the EU during the Eurozone Sovereign Debt Crisis. European Foreign Affairs Review, 19 (2), 195–220. Chaban, N., & Holland, M. (eds.) (2014). Communicating Europe in Times of Crisis: External Perceptions of the European Union. Houndmills: Palgrave Macmillan. Chaban, N., & Holland, M. (eds.) (2018). Shaping the EU’s global strategy: partners and perceptions. Houndsmill: Palgrave McMillan. Chaban, N., Elgström, O., Kelly S., & Lai S.-Y. (2013). Images of the EU beyond its borders: Issue-specific and regional perceptions of EU power and leadership. Journal of Common Market Studies, 51 (3): 433-451. Hall, S. (1997). Representation: cultural representations and signifying practices. London: Thousand Oaks, Calif: Sage, in association with the Open University. Georgakopoulou, A. (2007). Small stories, interaction and identities. Amstrdam / Philadelphia: John Benjamins. Hall, S. (1980/2001). Encoding/Decoding. In M.G. Durham and D. Kellner (eds.) Media and Cultural Studies: Keyworks. Oxford: Blackwell, 166-176. Harnisch, S., Frank, C., & Maull, H.W. (eds.) (2011). Role Theory in International Relations. London and New York: Routledge. Holsti, K. (1970). National role conceptions in the study of foreign policy’. International Studies Quarterly, 14 (3), 233-309. Horbyk, R. (2017) Mediated Europes: discourse and power in Ukraine, Russia and Poland during Euromaidan. Published PhD dissertation, Södertön University Doctoral Dissertations. Nadelmann, E. (1990). Global prohibition regimes: The evolution of norms in international society. International Organization, 44 (4): 479–526. Peeren, E., Horskotte, S. (2007). Introduction: The shock of the other. In S. Horskotte and E. Peeren (eds.). The shock of the other: situations alterities. Amsterdam, New York: Rodopi. Pickering, M. (2001). Stereotyping: The Politics of Representation. Houndmills: Palgrave Macmillan. Said, E. W. (1978). Orientalism. London: Penguin. 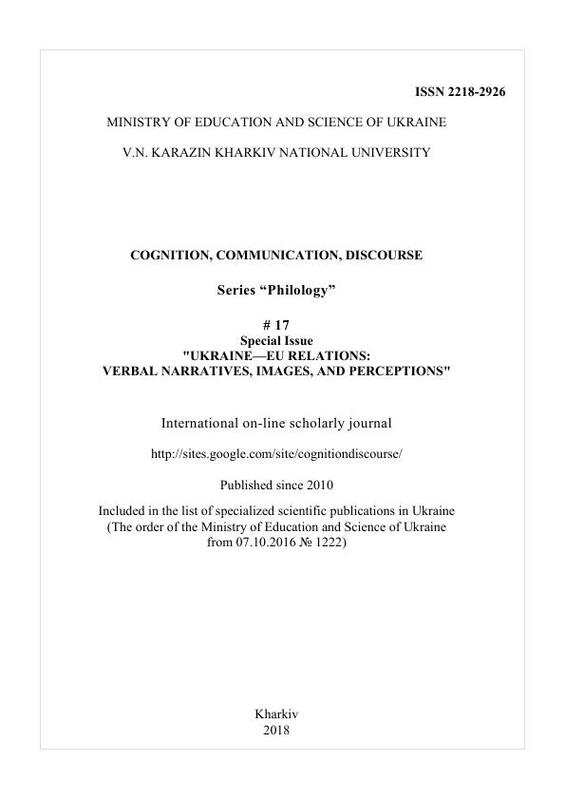 Natalia Chaban, Ole Elgström, Constructing bridges and fostering growth: Interdisciplinary insights into European Union conceptions and perceptions , Cognition, Communication, Discourse: No 17 (2018): Special Issue "UKRAINE-EU RELATIONS: VERBAL NARRATIVES, IMAGES, AND PERCEPTIONS"
Svitlana Zhabotynska, Images of Ukraine-EU relations in conceptual metaphors of Ukrainian mass media , Cognition, Communication, Discourse: No 17 (2018): Special Issue "UKRAINE-EU RELATIONS: VERBAL NARRATIVES, IMAGES, AND PERCEPTIONS"